National Caster's Medium/Heavy Duty Cold Forged Casters are zinc plated and treated for long wear and added strength. They feature a large double ball bearing raceway and top plate. 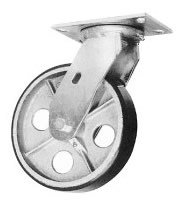 These casters a very versatile with a large selection of wheel types and options. Bearing options include roller bearings, Delrin bearings, precision bearing, ball bearings, sleeve or plain bearing, and no bearing. Optional brakes, grease seals, zerks, and thread guards are also available. Wheel sizes range from 4", 5", 6", 8", and 10" in diameter. Call 1-888-904-9531 for additional models, sizes, and ordering. Series #35 casters are excellent for a variety of heavy duty tasks including use on platform trucks, steer trailers, towline carts, maintenance carts, freight terminal carts, and other medium duty towed equipment. Rubber on Aluminum 400 NCC-35S420-RAR 6 NCC-35R420-RAR 5 "
Rubber on Polyurethane 450 NCC-35S420-TPRR 6.16 NCC-35R420-TPRR 4.6 "
4" Polyurethane on Polyolefin 700 NCC-35S420-PPUR 6.16 NCC-35R420-PPUR 4.6 "
Polyurethane on Steel 700 NCC-35S420-PUR 8.36 NCC-35R420-PUR 6.8 "
Solid Polyurethane 700 NCC-35S420-SPUR 6.16 NCC-35R420-SPUR 4.6 "
Polyurethane on Aluminum 800 NCC-35S420-PAR 7.26 NCC-35R420-PAR 5.7 "
Cushion PU on Polyolefin 700 NCC-35S420-SCR 6.16 NCC-35R420-SCR 4.66 "
Semi Steel 700 NCC-35S420-SSR 7.92 NCC-35R420-SSR 6.36 "
4" Heavy Duty Steel 900 NCC-35S420-SSR-HD 9.25 NCC-35R420-SSR-HD 7.75 "
Ductile Steel 1500 NCC-35S420-DSR 9.25 NCC-35R420-DSR 7.75 "
EZ Rolling Ductile Steel 1500 NCC-35S420-CDSR 9.25 NCC-35R420-CDSR 7.75 "
V Groove 1000 NCC-35S420-VGR 8.91 NCC-35R420-VGR 7.36 "
Polyolefin 450 NCC-35S420-POR 5.75 NCC-35R420-POR 4.75 "
Phenolic 800 NCC-35S420-PHR 7 NCC-35R420-PHR 6 "
High Temp Phenolic 800 NCC-35S420-PHR-HT 7 NCC-35R420-PHR-HT 5.5 "
Rubber on Aluminum 500 NCC-35S520-RAR 7 NCC-35R520-RAR 6 "
Rubber on Polyurethane 500 NCC-35S520-TPRR 6.82 NCC-35R520-TPRR 5.26 "
Polyurethane on Polyolefin 750 NCC-35S520-PPUR 6.82 NCC-35R520-PPUR 5.26 "
Polyurethane on Steel 1200 NCC-35S520-PUR 8.8 NCC-35R520-PUR 7.24 "
Solid Polyurethane 1000 NCC-35S520-SPUR 6.82 NCC-35R520-SPUR 5.26 "
Polyurethane on Aluminum 900 NCC-35S520-PAR 7.48 NCC-35R520-PAR 5.92 "
Cushion PU on Polyolefin 750 NCC-35S520-SCR 6.82 NCC-35R520-SCR 5.32 "
5" 2 EZ Rolling Polyurethane on Steel 1200 6-1/2 NCC-35S520-EZPUR 10 NCC-35R520-EZPUR 8.5 "
Semi Steel 1000 NCC-35S520-SSR 10.12 NCC-35R520-SSR 8.56 "
Heavy Duty Steel 1200 NCC-35S520-SSR-HD 11 NCC-35R520-SSR-HD 9.5 "
EZ Rolling Ductile Steel 1200 NCC-35S520-CDSR 11 NCC-35R520-CDSR 9.5 "
V Groove 1100 NCC-35S520-VGR 10.78 NCC-35R520-VGR 9.22 "
Polyolefin 650 NCC-35S520-POR 6.5 NCC-35R520-POR 4.5 "
Low Profile Rubber on Steel 600 NCC-35S620-LPR 10 NCC-35R620-LPR 9 "
Rubber on Steel 500 NCC-35S620-RSR 9.9 NCC-35R620-RSR 8.34 "
Rubber on Aluminum 550 NCC-35S620-RAR 7.75 NCC-35R620-RAR 6.75 "
Rubber on Polyurethane 550 NCC-35S620-TPRR 7.26 NCC-35R620-TPRR 5.7 "
Polyurethane on Polyolefin 900 NCC-35S620-PPUR 7.26 NCC-35R620-PPUR 5.7 "
Polyurethane on Steel 1200 NCC-35S620-PUR 10.78 NCC-35R620-PUR 9.22 "
Solid Polyurethane 1200 NCC-35S620-SPUR 7.26 NCC-35R620-SPUR 5.7 "
Polyurethane on Aluminum 1000 NCC-35S620-PAR 7.7 NCC-35R620-PAR 6.14 "
6" 2 Cushion PU on Polyolefin 900 7-1/2 NCC-35S620-SCR 7.62 NCC-35R620-SCR 5.76 "
EZ Rolling Polyurethane on Steel 1200 NCC-35S620-EZPUR 11.78 NCC-35R620-EZPUR 10.28 "
Semi Steel 1200 NCC-35S620-SSR 10.78 NCC-35R620-SSR 9.22 "
Heavy Duty Steel 1200 NCC-35S620-SSR-HD 12 NCC-35R620-SSR-HD 10.5 "
Ductile Steel 1200 NCC-35S620-DSR 12 NCC-35R620-DSR 10.5 "
EZ Rolling Ductile Steel 1200 NCC-35S620-CDSR 12 NCC-35R620-CDSR 10.5 "
V Groove 1200 NCC-35S620-VGR 12.32 NCC-35R620-VGR 10.76 "
Polyolefin 750 NCC-35S620-POR 7.25 NCC-35R620-POR 6.25 "
Phenolic 1200 NCC-35S620-PHR 8.25 NCC-35R620-PHR 7.25 "
High temp Phenolic 1200 NCC-35S620-PHR-HT 8.25 NCC-35R620-PHR-HT 6.75 "
6" 2-1/2 Polyurethane on Steel 1500 7-1/2 NCC-35S625-PUR 13 NCC-35R625-PUR 12 "
Semi Steel 1500 NCC-35S625-SSR 12.75 NCC-35R625-SSR 11.75 "
Phenolic 1500 NCC-35S625-PHR 9.5 NCC-35R625-PHR 8.5 "
Rubber on Steel 600 NCC-35S820-RSR 11.88 NCC-35R820-RSR 10.32 "
Rubber on Aluminum 600 NCC-35S820-RAR 9.25 NCC-35R820-RAR 8.25 "
Rubber on Polyurethane 600 NCC-35S820-TPRR 7.7 NCC-35R820-TPRR 6.14 "
Polyurethane on Polyolefin 950 NCC-35S820-PPUR 7.7 NCC-35R820-PPUR 6.14 "
Polyurethane on Steel 1400 NCC-35S820-PUR 14.3 NCC-35R820-PUR 12.74 "
Solid Polyurethane 1400 NCC-35S820-SPUR 7.7 NCC-35R820-SPUR 6.14 "
Polyurethane on Aluminum 1100 NCC-35S820-PAR 7.7 NCC-35R820-PAR 6.14 "
8" 2 Cushion PU on Polyolefin 950 9-1/2 NCC-35S820-SCR 7.7 NCC-35R820-SCR 6.2 "
EZ Rolling Polyurethane on Steel 1400 NCC-35S820-EZPUR 15.3 NCC-35R820-EZPUR 13.8 "
Semi Steel 1400 10-1/8 NCC-35S820-SSR 14.3 NCC-35R820-SSR 12.74 "
Heavy Duty Steel 1400 NCC-35S820-SSR-HD 15.3 NCC-35R820-SSR-HD 13.8 "
Ductile Steel 1400 NCC-35S820-DSR 15.3 NCC-35R820-DSR 13.8 "
EZ Rolling Ductile Steel 1400 NCC-35S820-CDSR 15.3 NCC-35R820-CDSR 13.8 "
V Groove 1400 NCC-35S820-VGR 16.94 NCC-35R820-VGR 15.38 "
Polyolefin 1000 NCC-35S820-POR 8.5 NCC-35R820-POR 7.5 "
Phenolic 1400 NCC-35S820-PHR 9.5 NCC-35R820-PHR 8.5 "
8" 2-1/2 Polyurethane on Steel 1500 9-1/2 NCC-35S825-PUR 15.25 NCC-35R825-PUR 14.25 "
Semi Steel 1500 NCC-35S825-SSR 14.25 NCC-35R825-SSR 13.25 "
Phenolic 1500 10-1/8 NCC-35S825-PHR 11 NCC-35R825-PHR 10 "
10" 2-1/2 Polyurethane on Steel 1500 11-1/2 NCC-35S1025-PUR 17.5 NCC-35R1025-PUR 16.5 "
Semi Steel 1500 NCC-35S1025-SSR 16.5 NCC-35R1025-SSR 15.5 "
Phenolic 1500 NCC-35S1025-PHR 12.75 NCC-35R1025-PHR 11.75 < "